Basil pesto | This Girl’s Gotta Eat! This is a tasty and easy salad to help enjoy the bounties of fresh summer produce. Here I’m featuring kale, tomatoes, cucumbers and shallots from our Fresh Fork Market CSA share. Serve with whatever protein looks good to you and dig in. I love easy meals like this that allow me to spend more time enjoying the beautiful day, and less time in the kitchen! Drizzle shucked corn with a little olive oil and grill until slightly charred all over, about 5-7 minutes. Remove corn from the grill and set aside until cool enough to handle. I picked the following trick up from Rachel Ray and it works like a charm – place a small bowl upside down inside a large bowl. Stand the corn up on the bottom of the small bowl and using a large knife, cut corn off the cobs. The kernels will easily collect in the big bowl. When all the kernels are cut off, remove the small bowl. Add the tomatoes, cucumber and shallots to the bowl with the corn. Add the pesto and vinegar, and mix well to combine. Add the kale to another bowl. Squeeze in lemon juice and a good drizzle of olive oil. Season lightly with salt and pepper to taste. Massage gently with your hands for a couple of minutes, ensuring the kale is evenly coated. Massaging the kale will help it break down a little and soften, making it easier to eat and enjoy, in its raw form! To serve, divide the kale among plates. Slightly push kale to the sides, creating a hole in the middle. 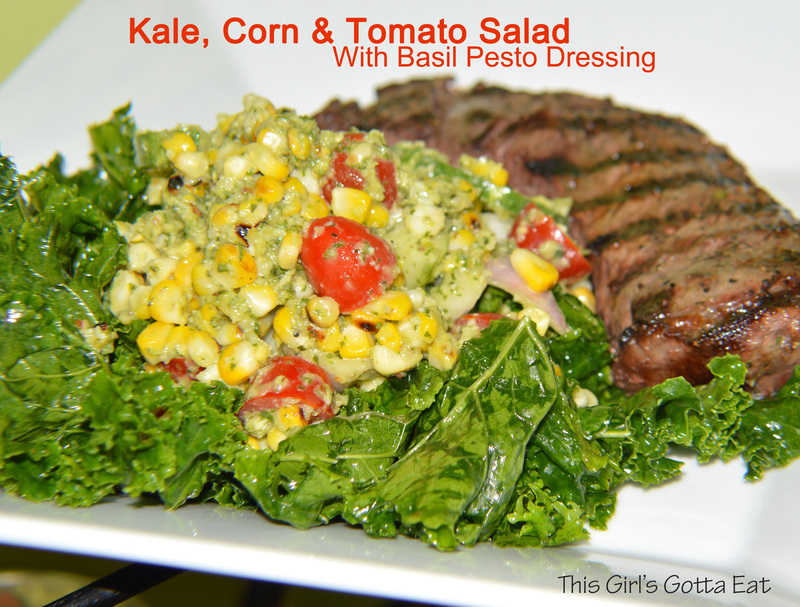 Divide the corn and tomato salad among plates, filling the kale hole. Serve with a protein of your choice. Pictured above is petite sirloin steak. Categories : Beef, Meatless, Satisfy, This girl has recipes! My mother-in-law had an abundance of basil in her garden, and when summer came to an end she whipped up a huge batch of pesto and gave me a nice big mason jar’s worth! Her pesto was the inspiration for this quick dinner, and a reminder not to let summer’s fruitfulness go to waste! Dig out that pesto in the back of your fridge and whip up dinner…presto! Boil water, add salt and cook macaroni to al dente according to package instructions. Once done, reserve some of the cooking water and drain. Heat a little olive oil in a large skillet over medium heat. Add green beans and cover. Saute green beans (covered which will also partially steam them) while the pasta cooks, tossing occasionally. Season lightly with salt and pepper. 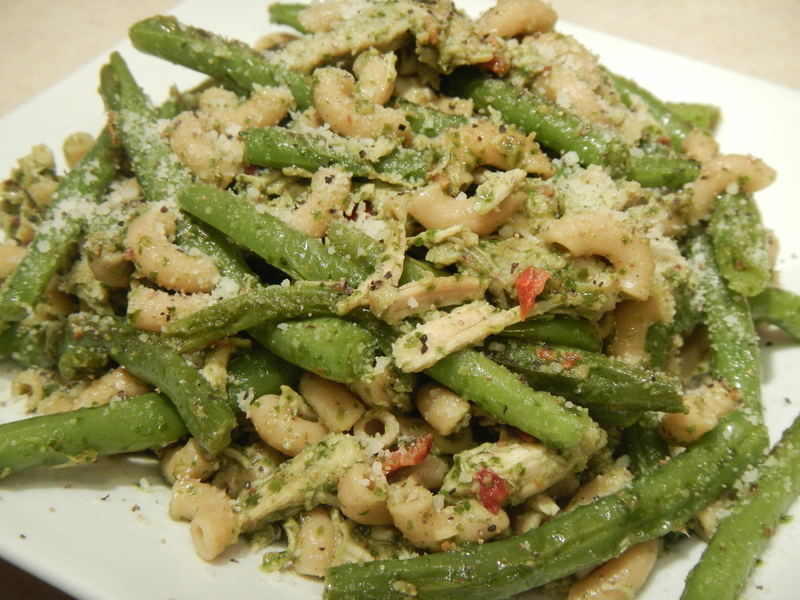 Add pesto, cooked macaroni, shredded chicken and sun-dried tomatoes to the green beans and stir to combine. Add a little of the pasta cooking water to loosen up the pesto and turn into a sauce. As far as how much pesto to add, just eyeball it – you want all the ingredients coated. Dish up, top with grated parm and enjoy!